Press-hardening operations have all the elements of a fire hazard: hot surfaces, pressurized mineral oil in the hydraulic systems and the proximity of hot surfaces to the pressurized oil. If the oil ignites, it can create a torch-like, exploding fire resulting in significant equipment damage and even the loss of life. As dangerous as mineral oil is in this environment, it is the standard “first fill” for OEMs due to its inexpensiveness and availability. Nearly all press-hardening hydraulic systems in service today are filled with a hydraulic fluid that presents a considerable fire hazard. Even though press-hardening operators are concerned about the risk, many are not aware of safer, more cost-effective hydraulic-fluid alternatives. 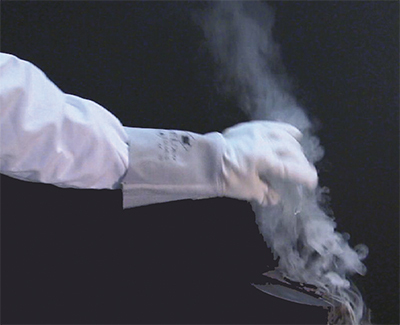 Mineral oil as it touches a hot surface. 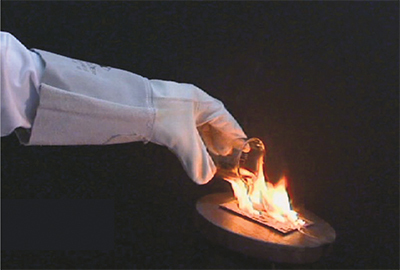 Mineral oil has explosive combustion. 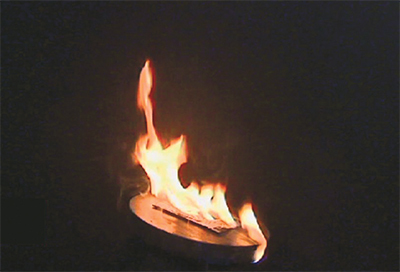 A mineral-oil fire can spread quickly. A synthetic, water-free alternative to mineral oil does not explode. 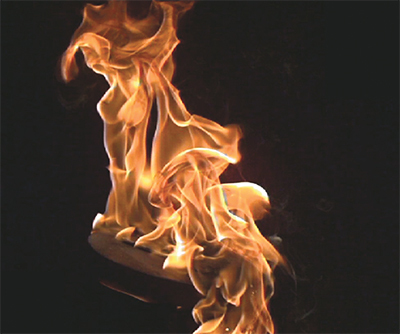 A fire involving the alternative fluid does not spread as easily. • Loss of ability to deliver components. 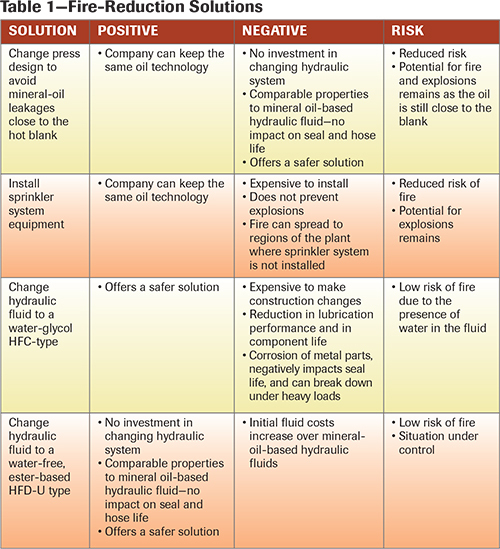 To mitigate the negative effects of fire and explosions on safety and production, many press-hardening operators are taking a fresh look at hydraulic fluids that offer increased fire resistance—water glycols (HFC) and water-free fluids (HFD). As they evaluate alternatives, operators must consider a range of factors including the cost to convert to a new fluid and the longer-term total cost of ownership. OEMs and fluid suppliers can help to evaluate overall costs and benefits of a conversion to these fluids. A case study shows how a conversion might proceed. The press-hardening lines at a large stamping company had experienced a number of fires resulting from ruptured hoses and leaking couplings that deposited oil onto hot work surfaces. In 2012, one fire resulted in worker injuries and more than one week of downtime, costing the company more than $6 million in damages. The gravity of the situation convinced management to take immediate action to reduce a fire risk. The management team solicited supplier proposals and evaluated available solutions to identify their best option from both a technical and financial perspective. Its approach weighed the positives and negatives (see Table 1—Fire-Reduction Solutions). Management concluded that the safest and most cost-effective alternative was to replace the mineral oil currently used in press-hardening operations with a synthetic, water-free, HFD-U fluid. Though costing more than mineral oil, the HFD-U fluid offered the best overall value, lowering fire risk and improving safety without costly equipment changes or increased maintenance costs. After deciding on an HFD-U fluid, management narrowed its choice of fluid suppliers and specific products to trial, and ultimately selected Quaker Chemical Corp., Conshohocken, PA, and its QuintoLubric 888-46 fluid. Shortly after the hydraulic equipment began running with the HFD-U fluid, a hose ruptured on one of the lines. Thanks to the fluid’s fire-resistant properties, the incident caused no major damage nor loss of production, according to Quaker Chemical officials. 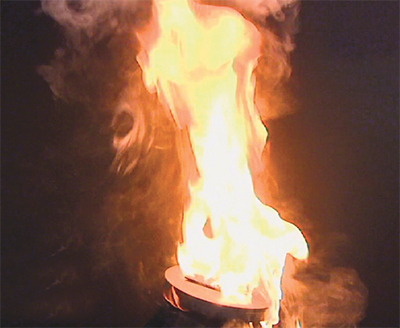 As a result, the press- hardening company decided that all future units installed would be filled with the HFD-U fluid. • Running a 6-month trial, including regular fluid analysis. Article provided by Quaker Chemical Corp., Conshohocken, PA; 610/832-4000; www.quakerchem.com. …by attending a free 1-hr. webinar presented by Ronald Knecht, global business development and OEM manager–fluid power, Quaker Chemical Corp., scheduled for Thursday, March 3, beginning at 2:00 EST. Visit www.metalformingmagazine.com to register. See also: Quaker Chemical Corp.